AVI is a common video format for different devices, while 3GP is more often used on mobile phone. Sometimes your avi file can't be played by your mobile phone. In this case you can try the following 5 popular and FREE online video converters and one desktop video converter to simply convert AVI to 3GP. 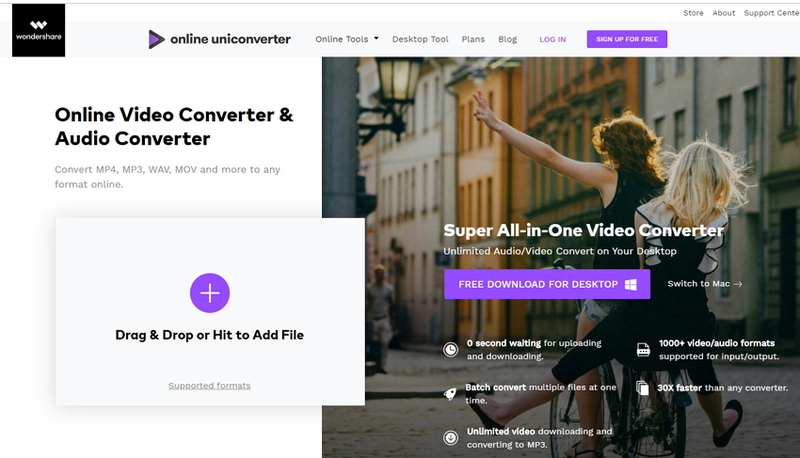 As a free and online video/audio converter, Online UniConverter (originally Media.io) allows you to convert AVI files to 3GP, MP4, MKV and other formats very easily. You can add two files to convert for each time and a maximum of 100MB files for conversion. Wondershare Video Converter is a desktop converter. It converts video to QuickTime MOV, Phone 3GP, etc. It supports converting, editing, burning and downloading video. For converting video, it supports almost any video formats. For editing videos, you can trim, add subtitles and add effect. Compared with other converters, it converts 30x faster than any other converters, and there is no file size limitations. Convert videos to 1000+ formats without any quality loss. Convert 30X faster than any converters on the market. An all-in-one video converter to easily convert video and DVDs, edit videos, burn DVDs, and download videos from popular video sharing sites. Better organize your iTunes library by adding metadata to movies, TV show and home videos. Benderconverter is a great tool that you won't miss. It supports converting video, audio and image by uploading the source file from your PC. To convert AVI to 3GP online, you can choose the output format as video for Phone under the video category. Then click the "Convert" button to start the conversion process. One thing you need to note that your source file should be less than 100 MB. With convert2mp3, you can just convert a video by entering the video url from YouTube, Dailymotion etc. Also, this online AVI to 3GP converter lets you convert by searching the artist, song name or video name, if you don't remember the video or audio url. The output format can be 3GP , M4A, AAC, FLAC, OGG, WMA, MP4, AVI, WMV. If your video file is less than 25 MB, you can try this online video converter. Considering that the supported video size is small, the converter works at high speed. For output video formats, it not only supports converting files to 3GP, but also other formats, including FLV, AVI, MOV, MPG, VOB, MP4, WMV, RM, DIVX. Apowersoft needs you to install a plug-in to activate the tool. After the plug-in is done, you can enjoy its powerful function. This online AVI to 3GP converter supports converting many formats, including MP4, AVI, MOV and WMV. Also it lets you set video and audio settings, for example the resolution, bitrate and frame rate.